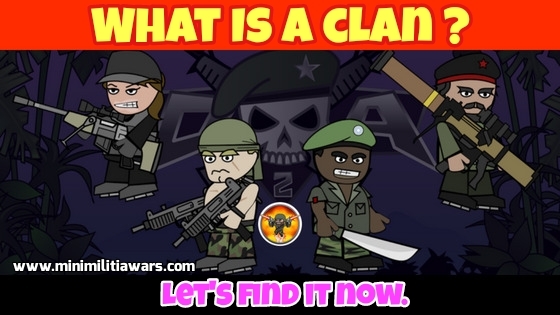 Home best avatar names best clan names clan names clans clans in mini militia clans india clans to join know about clan Mini militia mini militia 3 minimilitia minimilitiawars top clans of mini militia what is a clan What is a Clan in Mini Militia?? What is a Clan in Mini Militia?? Clans are a type of groups that people join by putting the acronym of their clan into your name. You are usually asked to join a clan by the leader or the founder of the clan. The goal of a clan is to make it grow and make it larger and larger. How do you begin a clan?? There are no known certain ways to begin a clan. You would just decide a name of the clan, Make your self a leader and you begin to grow it. Note: Starting a clan is not as easy as it seems. You will have to sacrifice some of your game time and convince others to join your clan. What are the clans out there I can Join?? Many Many clans are out there, but this is just a list of some of the clans. (if your wish to add a clan, please leave a comment below and the founder will add them. And remember, these are just a list of clans. You will have to contact the leader of it for you to be able to join.